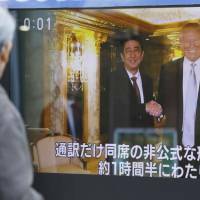 Japan’s foreign policy this year is drifting into uncharted waters inhabited by President-elect Donald Trump. And the biggest diplomatic priority for Prime Minister Shinzo Abe will be to navigate the country through this fog of uncertainty by forging a close relationship with the new U.S. leader, who will be sworn into office Jan. 20. In fact, Abe was quick off the mark. He became the first world leader to meet the president-elect following the Nov. 8 election. And it has been reported that the prime minister will have a summit with the 45th president of the United States later this month following his inauguration. 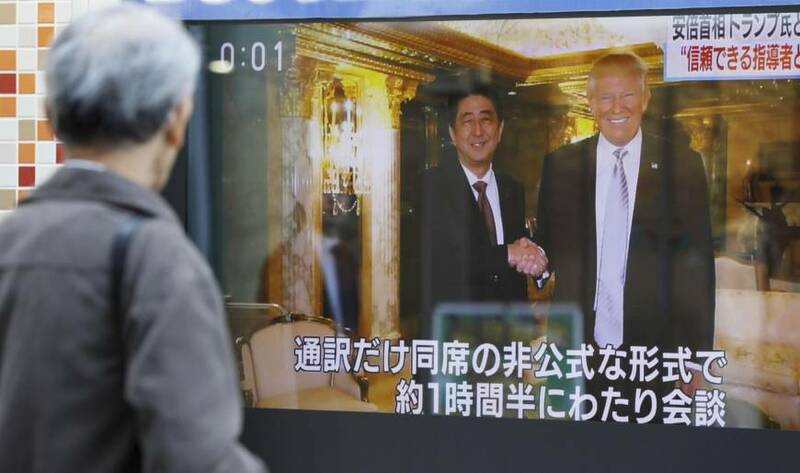 It is too early to tell if Abe can forge ties with Trump similar to those between Prime Minister Yasuhiro Nakasone and President Ronald Reagan in the 1980s, and Prime Minister Junichiro Koizumi and President George W. Bush in the 2000s. But some experts say that Abe, who became Japan’s fourth-longest-serving postwar prime minister on Dec. 5, can serve as a bridge between the U.S. and Asia because Trump sees him as a strong leader — especially when Trump is predicted to work more bilaterally rather than through a multilateral framework, in stark contrast with departing President Barack Obama’s “pivot” to Asia. “You have to look at the whole Asian region to deal with regional security issues there. Abe can tell Trump much about the delicate balance of Asia,” a senior Foreign Ministry official said. In accordance with Obama’s “rebalancing” policy to beef up the U.S. presence in the Asia-Pacific region, Abe has broadened Japan’s security network with other parts of Asia by providing patrol ships and other assistance to help them counter China’s growing military clout. Abe looks ready to push his efforts still further. The destinations of his first overseas trip in 2017 will be Australia, the Philippines, Vietnam and Indonesia. A high-ranking Foreign Ministry official said the trip has to be made before Trump’s inauguration ceremony so Abe can emphasize the importance of the multilateral security and economic frameworks. Trump’s presidency comes at a time when Asia is already in the throes of major political upheaval. South Korea will likely soon see President Park Geun-hye ousted, which will make it difficult — if not impossible — for Seoul to fulfill its landmark reconciliation deal with Tokyo over the thorny “comfort women” issue. North Korea, meanwhile, will continue to push its ambitions to develop nuclear weapons. Exactly how Trump will deal with the growing military threat from Pyongyang remains unclear. China is expected to continue flexing its muscles in the South and East China seas, and bellicose Philippine President Rodrigo Duterte is cozying up to Beijing while simultaneously threatening to sever security ties with the U.S.
For his part, Trump has argued that Obama has been too weak-kneed in pushing his “rebalancing policy” in Asia. Taken together, Trump’s moves seem to indicate that he is going to be more hawkish on China, which has the potential to upend the regional order. In light of this, critics agree that the biggest source of risk and unpredictability for Japan in 2017 is Trump’s China policy, especially given his lack of experience in diplomacy. For Japan, the biggest concern is if and how Trump will try to change the current arrangement of the Japan-U.S. alliance, which Tokyo and Washington have lauded as the cornerstone of the region’s peace and stability. The president-elect has already annoyed Tokyo by saying America’s biggest ally in Asia must pay more to enjoy the extended deterrence provided by the U.S. military, even though Japan in fiscal 2016 is covering 48.3 percent of the costs related to U.S. military bases on its soil. Tetsuo Kotani, a senior research fellow at the Japan Institute of International Affairs, said Trump is likely to ask for an increase in so-called host-nation support to appeal to the expectations of his supporters. Kotani, who has talked to some close Trump aides, said the president-elect’s team will likely be happy with just a fractional increase in such areas as utility costs. But he said such negotiations could give Japan a bargaining chip when it comes to the Senkaku Islands — the cluster of uninhabited islets administered by Japan but claimed by China and Taiwan. Tokyo is closely monitoring whether the president-elect will echo Obama, who was the first U.S. president to say that the Senkakus are covered by Article 5 of the Japan-U.S. security treaty. Abe is also ready to please Trump, who is expected to lead his foreign policy in a transactional way. The government is likely to bolster Japanese security with American-made missile defense systems in a bid to counter North Korea’s rapidly advancing nuclear weapons and ballistic missile technology. The tricky part, experts say, is that the Trump team might ask Tokyo to do more in the South China Sea, such as taking part in joint patrols, something the Obama administration likewise requested of Japan. Last year, Defense Minister Tomomi Inada said in a speech in Washington at the Center for Strategic and International Studies that Tokyo supports the freedom of navigation operations conducted by the U.S. in the South China Sea. She also said Japan will increase its engagement there through efforts such as conducting more Maritime Self-Defense Force joint training exercises with the U.S. Navy, but stopped short of mentioning Japanese participation in joint patrol missions. Government officials say Japan does not have enough resources to deploy Japan Coast Guard or MSDF units permanently to the area. The MSDF and the Japan Coast Guard in 2016 were kept busy dealing with Chinese ships in the East China Sea, with a large number entering and skirting Japan’s territorial waters, as well as its contiguous waters. Also in 2016, the Air Self-Defense Force scrambled fighter jets a record number of times in response to perceived incursions by Chinese aircraft. Meanwhile, China has already tested Trump with the recent seizure of a U.S. Navy underwater drone. Jaehwan Lim, an associate professor of international politics at Aoyama Gakuin University, said China is unlikely to do anything more provocative because President Xi Jinping wants nothing to disturb his preparation for the 19th Party Congress in November, when the composition of the Politburo Standing Committee will change. Any further involvement by Japan, however, would likely prompt China to take a more belligerent attitude in the South China Sea.